A biomedical sciences honors student shares his account of a Volunteer UCF alternative break experience. Chris Dimaculangan (back row, third from left) spent his spring break volunteering for a week with a Georgia refugee community. Clarkston, Georgia, is 456 miles from UCF on the outskirts of Atlanta and touts itself as the most diverse square mile in America. It’s a hub for refugees, seekers of asylum, and immigrants — the kind of fascinating melting pot where amazing Ethiopian and Somali restaurants sit right next to equally amazing tamale spots and ethnic grocery stores in the same strip mall. It’s a place where students can enter their schools speaking multiple languages — none of them being English. Clarkston is a city where people of numerous religions, cultures and backgrounds share the same apartments, the same neighborhoods, the same home. And I chose to spend this year’s spring break there. I had the life-changing opportunity to lead one of Volunteer UCF’s alternative break experiences over spring break along with trip co-coordinator and our special events director, Allison Gentile. 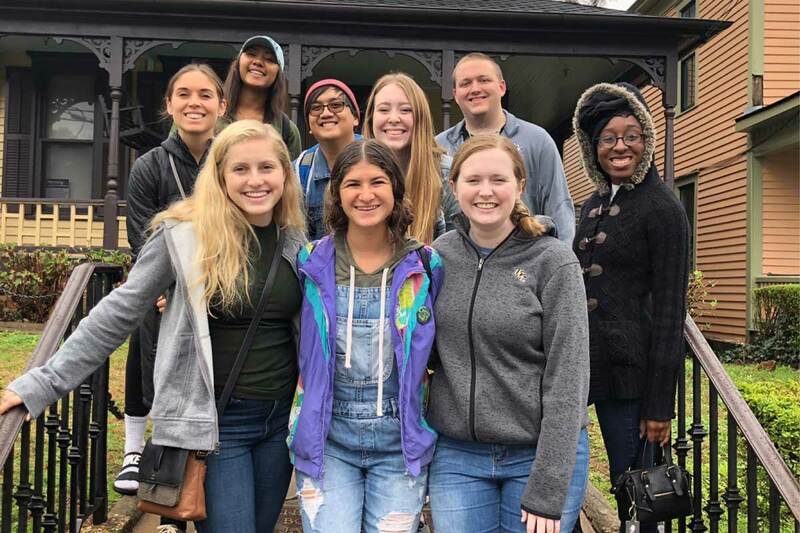 The Clarkston trip was one of six service experiences in 2019 where UCF students spent time at various sites throughout the United States and internationally. There’s a really intentional choice with the word “experience.” At ABP, we label our trips with this word because they’re more than just destinations we go to and eventually return from. They’re more than journeys that we take in lieu of a “normal” school break. They’re experiences that can be accomplished by anyone and everyone. What we hear annually from students who sign up for ABP is that not only did they uplift the communities they volunteered in and called home for a week, but the experiences fundamentally uplift and change them. And that’s the goal. These experiences are meant to be carried with you back to campus — to be shared and to be treasured, and to inspire and be inspired by — to serve whatever communities you find yourself in. Before this year, I had only heard stories about the unbelievable spring breaks that student participants have had. My position as ABP’s marketing director is a job that traditionally involves staying on campus sorting through all the photos, videos, and statements from our board’s service trips to places around the world, and trying to craft stories out of them that will appeal to our UCF students. However much I felt inspired and empowered by their energy and their testimonies, I knew I needed to get involved in the action this year. And just as I expected, going on the experience is something no story could do justice, even though I’m about to try. I could tell you about the elementary schools we entered where kids gave me new nicknames, but these words are so much less vivid than actually seeing them write all over your visitor nametag in a multitude of languages right before your eyes. I could write about the students in afterschool programs we helped that organized makeshift soccer matches with a multitude of languages and communication difficulties, but no language can quite capture the feeling of seeing the students improvise, adapt and overcome these barriers to thoroughly and collectively outplay me on the pitch from start to finish. I could talk about the enormous boxes of donated surplus medical supplies that we sorted through with Atlanta’s Med Share division, but no words can come close to the overwhelming level of personal satisfaction of sending off a pallet of tools and provisions to areas and countries that need them the most. I could go on about the laughs my team of fellow UCF students and I shared together, the hours we drove, the tears we shed, and the communities we touched. But actually experiencing the alternative break with all its fulfillment, all its compassion, all its growth and unflinching vibrancy of life, goes so far beyond anything I can say here. My biggest takeaway from all of this is to implore you to go out and experience the world, but don’t just do it for the ’Gram. Really experience the communities that are there. Chris Dimaculangan is a fourth-year biomedical sciences major and Burnett Honors Scholar who is also minoring in music and education. He is a National Merit Scholar and plays alto saxophone as a member of the Marching Knights. Who is “The Stare-Down Kid” at UCF’s Football Games?